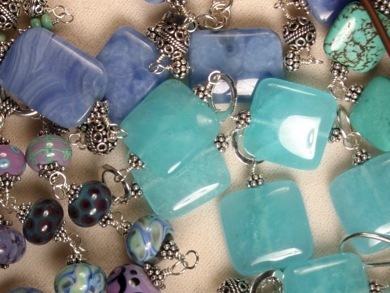 I use a variety of hand-made sterling silver beads, hand-crafted glass beads, semi-precious gemstones, and Swarovski crystals to create necklaces, bracelets, and earrings. This site features several of my most recent collections. Some styles are ornate and sophisticated, while others are more sleek and casual, but all can be dressed up or down to fit most any occasion. Many pieces can be lengthened or shortened to create a custom fit. Because I don’t like to duplicate my work, every necklace or bracelet is an original design. Some pieces may be similar, but no two will ever be exactly alike. I hope you like what you see on Sandstone-designs.com If you’d like more information about a specific piece or if you’re interested in hosting a private showing in your home, for you and your friends, please contact me.